Clipping your bird's wings serves several purposes. The taming process is much easier and faster with their wings clipped and you have better control over your bird while taming it. Wing trimming will also prevent your bird from flying into objects such as windows or mirrors and injuring itself. Although wing clipping is necessary for all pet birds, it does remove one of the exercise modalities that birds depend on. Therefore, it is important for you as a responsible bird owner to offer your bird an alternative exercise method. We recommend a cage large enough for your bird to climb around in, with several different toys to encourage play. We also feel it is important that you have your bird out of its cage as often as possible. A good place for the bird to play when it is out of its cage is on a playpen. There are several different varieties on the market now. Some companies will even custom build them to your specifications. Avian Treasures custom builds great playpens and offers several types for birds of all sizes. A playpen provides your bird with a place of his own where he can exercise and play without being confined to his cage. Birds with clipped wings will almost always stay on their playpens, especially if the playpen offers a lot to keep them occupied. Several different methods of wing clipping are in print and everyone has their own opinion on the correct method. The method we have found that works the best is to clip the outer primaries of BOTH wings, below the level of the primary coverts. The number to remove on each side varies with species as well as individually. The primaries must be cut because they are the feathers that give lift when the bird flaps its wings. The secondary flight feathers should be left intact to give some air resistance in case the bird falls. It is important to trim both wings so the bird is able to maintain its balance. We do not recommend plucking the feathers because they will grow back out in six weeks and it is a very uncomfortable experience for the bird. It is important to remember that clipped feathers will molt out and new ones will replace them within a few months. When the new feathers grow in they contain a pulp consisting of blood vessels and nerves. You should not clip the blood feathers because they will bleed profusely and cause the bird a lot of pain, stress, and blood loss. It is best to wait until the feathers are fully mature before clipping the wings again. Some birds are very strong fliers and may still be able to fly even after being clipped. So, do not risk taking the bird outside, trusting the wing clip, only to have something suddenly scare your bird, and cause it to fly off into the wild blue yonder. You will be left standing there with your mouth open, thinking --"But, ....But,...s/he was clipped!" I have seen it happen, with no matter as to the tameness of the bird. Just as a side thought, please do not put those nasty leg chains on your bird. They will invariably lead to a broken leg. Trimming your birds' nails also serves several purposes. When their nails become too long perching is uncomfortable and it may lead to more serious foot problems. Long sharp nails are also uncomfortable to you when your bird perches on your bare skin. Long nails may also become snagged in toys, clothing or on a cage and can result in serious leg or foot injuries. When trimming your bird's nails it is important to remember that each nail has a blood and a nerve supply called the quick. Remember that the quick grows with the nail and an overgrown nail will have a longer quick. If you trim the nail too far back and cut the quick, it will bleed and will be painful to the bird. Any amount of blood loss, however small, is significant and should be stopped immediately with pressure and a styptic compound. The beak also has a quick like the nails and the same precautions should be considered when correcting the beak length. If your bird has plenty of toys to chew on, a Polly Perfect or lava rock perch to rub its beak on, and its beak is growing normally, it should not be necessary to trim the beak. It may be necessary, however, to file the tip with an emery board or nail file to dull the point or shorten its length slightly. If the beak is growing too fast or growing abnormally, you should see your avian veterinarian to determine the cause and cure. Wing, nail and beak trimming are simple procedures. If you are inexperienced with how to perform them, then have your avian veterinarian show you the proper instruments needed and the correct method of trimming. Once you have done it a few times it becomes easier. 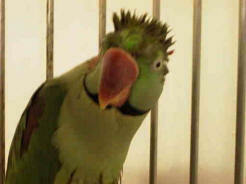 I recommend, however, that owners let others do the grooming so their bird does not become distrustful to the owner.